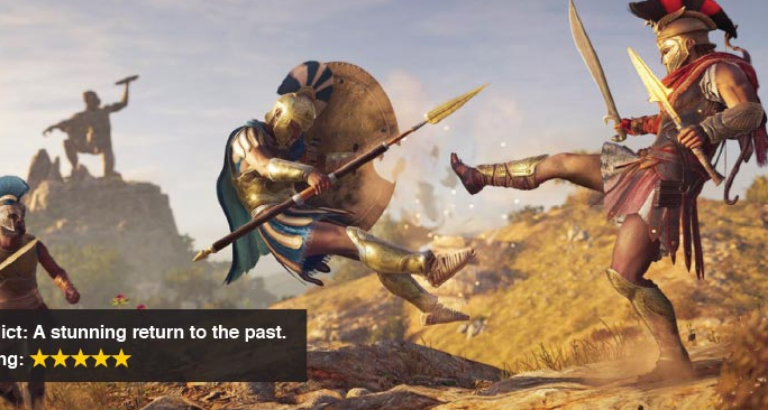 Assassin’s Creed Odyssey is an action role-playing game developed by Ubisoft Quebec, the 11th major instalment in the popular series. Set in the year 431BCE, the plot tells a fictional history of the Peloponnesian War between Athens and Sparta. Players control a male or female mercenary who fights for both sides as they attempt to unite their family and uncover a malign cult. The game brings a fresh makeover to the series, and places more emphasis on role-playing elements. It contains dialogue options, branching quests and multiple endings. The player can also develop romantic relationships with non-playable characters of both genders, regardless of which one they choose. This all helps to make the world, and the people who inhabit it, feel like a living, breathing environment. The player character, Alexios or Kassandra, is a mercenary, and a descendant of the Spartan king Leonidas I. They inherit his broken spear, which is forged into a blade to become a weapon that grants the player special abilities in combat. 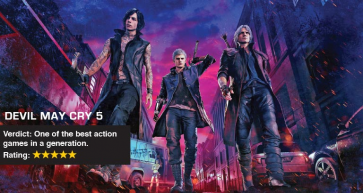 Along with a skill tree system that allows the player to unlock new abilities, it allows for the most diverse and intricate fighting the series has seen yet. Odyssey’s world is the biggest and most vibrantly colourful of the series. Even though much of it is blanketed in the fickle blue waters of the Aegean Sea, its playable acreage is immense and rivalled only by its sheer jaw-dropping beauty. Greece is a stunning series of picturesque locales: white-stone isles, eternally autumnal forests, sun-blasted desert islands, an endless expanse of beach, alabaster cities defended by titanic statues of bronze and stone, and the inviting, rolling waves of the open sea. In WWE 2K19, experience authentic WWE gameplay, extensive creation options, engaging match types, fan-favourite modes and more. The game packs in a massive roster of popular WWE Superstars, Legends and Hall of Famers, as well as NXT favourites. Engage in the action through jaw-dropping graphics, heart-pounding excitement and thousands of new gameplay animations that enable you to experience WWE at its most realistic level yet. Call of Duty: Black Ops 4 offers a gritty, grounded, all-out combat experience, raising the bar with a Multiplayer mode that increases tactical gameplay and player choice, and also the biggest Zombies offering ever with three full experiences at launch. New to the series is Blackout, where the Black Ops universe comes to life in a massive battle royale experience featuring iconic characters and locations from all four Black Ops. Forza Horizon 4 is a racing game based in a fictional representation of the UK and features over 450 licensed cars. The game features a dynamic weather system that also depicts the change of seasons. The environment in the world will change depending on the season: for example, lakes will freeze over in winter and allow players the ability to explore regions of the game world that would be inaccessible during all the other seasons.